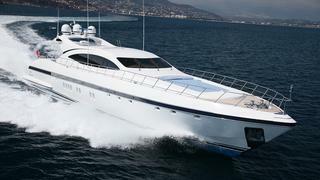 The 33.48 metre Mangusta motor yacht O’, listed for sale by Yachtzoo in Monaco, has been sold with MySea introducing the buyer. Built in GRP by Italian yard Overmarine to an in-house design and Bureau Veritas classed, she was delivered in 2007 as a Mangusta 108 model. A striking interior by Guido de Groot features Ralph Lauren fabrics throughout and she accommodates eight guests in four cabins. These consist of a master suite with panoramic windows and a private lounge, a VIP suite and a double and children’s cabin with bunk beds. All cabins have large screen televisions, DVD players and en-suite bathroom facilities. On the aft deck, a large awning provides shade for the cockpit, which has a high-end iPad controlled sound system. This area can accommodate 12 guests at two large dining tables or four individual coffee tables. The sophisticated interior of the saloon has rich blue upholstery contrasting with the white lacquered floor, fine chrome fixtures and a bar with a pearlescent shine. Once the sunroof is opened, light floods in to show off the décor at its best. Two large U-shaped sofas invite guests to sit down comfortably around a telescopic table where up to 12 guests can dine in the formal dining area. Last but certainly not least, ample power is available from twin 2,730hp MTU engines giving her a cruising speed of 30 knots, topping out at 35 knots. O' was asking €3.3 million.